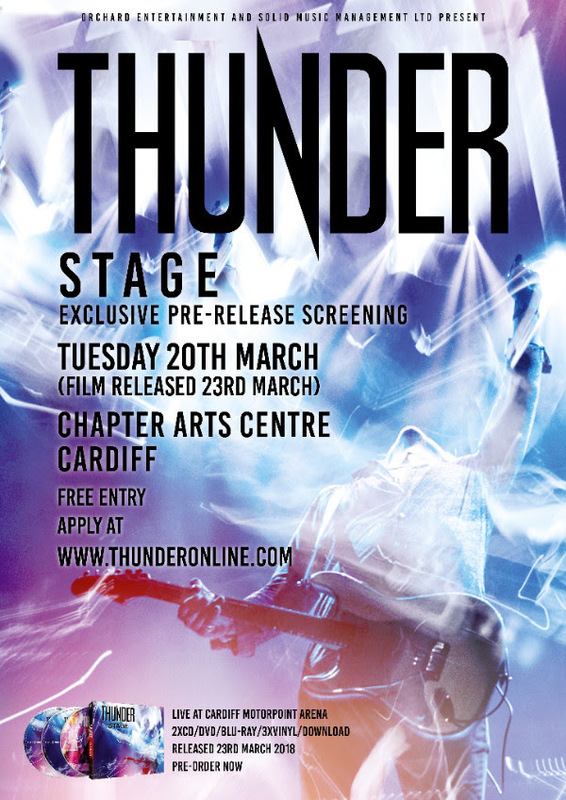 Thunder are delighted to announce that, ahead of the release of the live film / album Stage on 23 March 2018 there will be an exclusive screening, three days before the official release date. The band will screen the film in a cinema in the city where it was recorded, Cardiff, on March 20th 2018. This screening is open only to competition winners, entry is free via the band’s website. 200 winners will be chosen randomly and informed in early March, entry will be by guest list only. We’re chuffed to pieces with the way the film turned out, and to get to show it to fans ahead of release is pretty sweet. Even better that it’ll be shown in Cardiff, where the show took place. I wish I was going, but it’s a fair way for me, and I’ve already seen it of course. Stage features hits from right across the band’s career and includes fan-favourite classics like ‘Backstreet Symphony’, ‘River Of Pain’ and ‘Love Walked In’ and bringing things right up to date with tracks from the 2017 Top 3 UK Chart Album title track Rip It Up’ and ‘She Likes The Cocaine’. Thunder are of course a noted and globally in demand live act. ‘Stage’ was captured at Cardiff Motorpoint Arena on March 24th 2017 during the UK Tour.